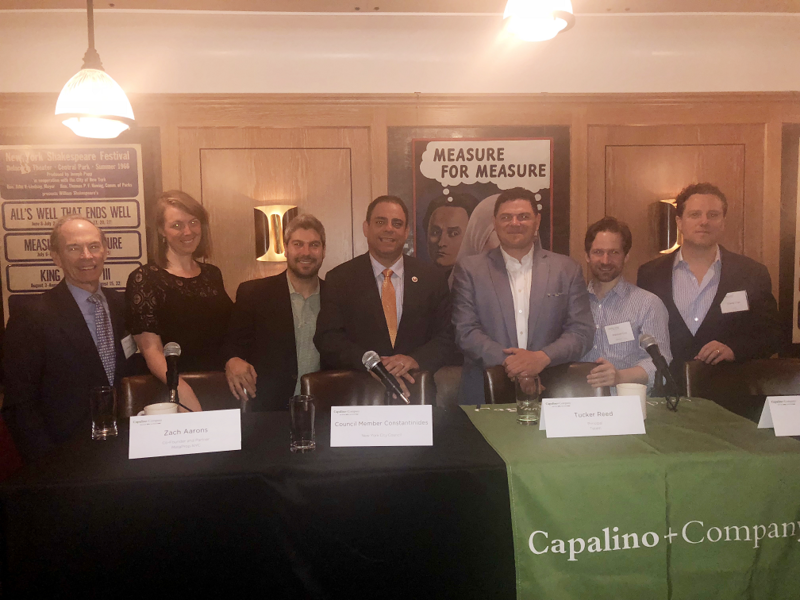 On May 22, I had the pleasure of moderating a Capalino+Company panel on “How Greener, Greater Building Tech is Powering NYC.” The discussion highlighted the critical role buildings play in the City’s sustainability goal to reduce its greenhouse gas emissions 80 percent by 2050 (80×50). According to the City’s Roadmap to 80×50, more than two-thirds of the City’s greenhouse gases came from the City’s buildings in 2014. Ninety percent of the City’s current building stock will still exist in 2050. Thus, reaching the City’s “80×50” goal will require taking steps to reduce the energy consumption in today’s buildings, as well as designing and building our future buildings to take advantage of emerging heating, air conditioning, lighting, and other technologies to reduce energy consumption. The morning kicked off with Zach Aarons, Co-founder of MetaProp NYC, who shared his insights from investing in green building solutions from within a real estate tech accelerator. From Zach’s perspective,“technology is interacting with sustainability to develop an eco-consciousness for the built world. 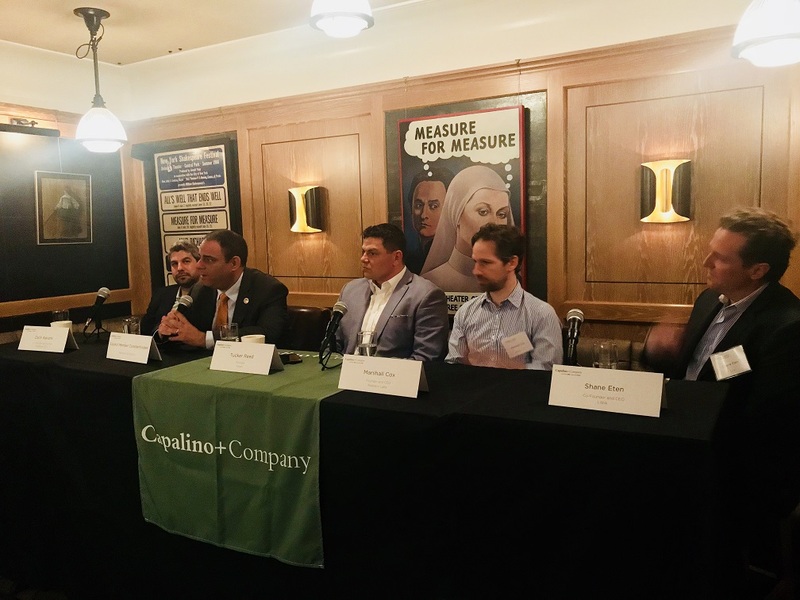 The next few years are going to be an exciting time.” The panelists certainly echoed this sentiment in their discussion of a wide range of topics, including emerging policies aimed at reducing these emissions and the entrepreneur’s experience of making the business case for sustainability. Tucker Reed of Totem added his perspective as a real estate tech advisor in the NYC. Their advisory specializes in real estate development, urban design, and technology. He sees NYC’s high concentration of building stock coupled with a broad network of technology talent as the ideal elements to make the city a global leader in the development of real estate technology. Both MetaProp and Totem play the critical role of bridging the gap between investors and entrepreneurs. MetaProp NYC and Totem both focus on two key points when working with sustainability entrepreneurs: operational efficiency and customer expectations. In their view, building managers seek low-impact solutions to improve the efficiency of their building systems. To be successful, entrepreneurs need to demonstrate how their technology improves a building’s performance. With respect to customer expectations, they focus on communicating how sustainability measures offer marketing value to real estate developers. Or, to put it another way, aligning a building’s marketing with the increasingly-important climate concerns of many tenants has the potential to become as important as providing an on-site gym. The panel’s featured entrepreneurs built from the investment-level conversation to consider the experience at the user level. Shane Etan, Co-founder at Lotik, explained that even if a technology is groundbreaking, it’s essential that it’s also realistic and usable for the consumer. Lotik has developed a system of smart sensors that quickly detect leaks. The system is appealing to consumers, in part, because of its quick installation and wireless usage tracking. Marshall Cox, Founder and CEO at Radiator Labs, stressed the increased tenant comfort experienced following the installation of his company’s smart insulating radiator covers. Not only to they provide a solution for steam-heated apartments that are too warm, they can save up to 35 percent in fuel costs for their clients. While the private sector promotes the economic value of efficiency, New York City policy makers are focusing on creating the incentives and programs that will help ensure that the City meets its long-term 80×50 goal. Councilmember Costa Constantinides (District 22) highlighted his efforts to advance building efficiency as Chair of the City Council’s Committee on Environmental Protection Committee. Just last month, building efficiency was a top priority of the Council’s Earth Day announcement of an Environmental Protection Package. Councilmember Constantinides explained that his priority is to reduce red tape for those looking to integrate energy efficiency into their projects. Currently, building sustainability measures often require approvals and interactions with numerous city agencies,and his goal is to create policies that make green choices as easy as sticking with the status quo. Mitigating the impact our buildings have on the climate is increasingly important, and increasingly achievable. We are excited to keep watching as the green building sector continues to grow and new solutions emerge. For more information on our Energy, Environment + Sustainability Services, contact Challey Comer at challey@capalino.com or 212-616-5874.